BLOUNTVILLE — Shelby Warren: architect, detective, teacher, artist or writer? The jury’s still out on that career choice since Shelby is only a fourth-grader, but this summer the Holston Elementary student will join other elementary school students from across the nation to take part in the National Youth Leadership Forum (NYLF): Pathways to STEM, taking place in Winston-Salem, N.C.
Shelby, during an interview Friday at the school, said she’s thought about various careers, including a scientist when she was younger. However, Shelby’s math and science teacher, Leigh Ann Miller, said she nominated Shelby for NYLF because of her desire and willingness to learn. 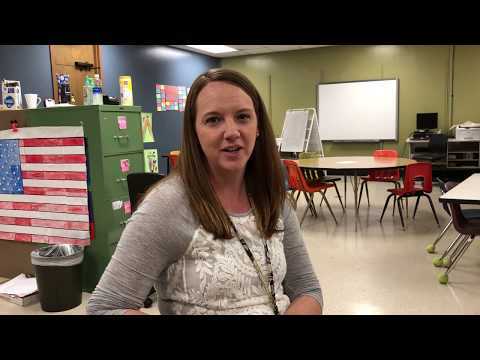 Shelby said she doesn’t have a favorite subject, but the admittedly shy student, with a little prodding from Miller, said she liked math, project-based learning and hands-on learning. “Shelby constantly says, ‘If I could just learn. That’s all I want to do is learn,’ ” Miller said. Shelby’s father, Wes, said Shelby is well-rounded and likes to help him do projects. “She comes out to the garage a lot wanting to help,” he said. Her mother, Lauren, plans to travel to North Carolina with Shelby. Lauren said participation for Shelby in NYLF is $2,200. Wes and Lauren, of Blountville, also have a son, kindergarten student, Micah, at Holston Elementary. NYLF: Pathways to STEM is one of the Envision family of programs (www.envisionexperience.com) that enables students to explore their interests and experience learning beyond the classroom. Shelby was nominated to attend the forum by Miller. In addition to participating in her church choir, chimes and her schools’ running club, Shelby is also passionate about reading, writing, swimming and spending time with her family or friends. With dreams of becoming an architect, detective, teacher, artist or writer, Shelby is looking forward to gaining the hands-on experience that the forum provides. Since 1985, Envision programs have served more than 800,000 students in more than 145 countries, with programs designed to help students develop the leadership, scholarship and career skills needed to succeed in a competitive college and career landscape. Miller said NYLF contacts her each year to see if she has a student to recommend for the project, and she said Shelby fit the bill as a student with a desire to learn and experience new opportunities.